Belmond Cap Juluca stands out from the crowd with its famed platinum beach’s pristine sands, land and water activities and enchanting, Moorish-style beachfront accommodations. You are beach ready everyday as each guest room includes two reserved chaise lounges, extra-large umbrellas and table, and beverage and meal service with chilled towels. 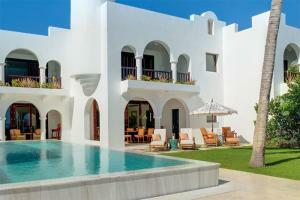 Suites and villas offer private terrace and pool options for unparalleled privacy. When not soaking up the sun and diving into the azure waves, experience dining menus filled with island flavors from herbs and spices from the resort’s bountiful garden. An infinity-edge pool with a lush courtyard and tree-lined sunbathing decks, sports courts, and fitness center with yoga and workout equipment are on-site. Snorkeling gear, kayaks, sailboats, PADI dive shops, along with water skiing, windsurfing, and tennis instruction are accessible for those with adventurous spirits.